Roll-Up Reporting lets you easily aggregate data from multiple websites, mobile apps and shops into a Roll-Up site to gain new insights and save time. Roll-Up Reporting is a premium feature which is included in our Cloud-hosted Business plans or you can purchase it on the Matomo Marketplace if you self host Matomo On-Premise. Learn more about all the benefits and features of Roll-Up Reporting. When you have several shops (eg white-labels) it is very valuable to see how your ecommerce shops are performing overall. Or when you are a web agency and you are serving many customers and want to provide each customer with a single aggregate view of all their web properties. You can create Roll-Ups in the Websites Management the same way you would create a regular website or app. Once installed, the menu item in the administration might be renamed from “Websites” to “Measurables”. To create a Roll-Up, go to Matomo (Piwik). In the top menu click on “Administration” and then “Measurables: Manage”. Next click on “Add a new measurable” and in the dialog choose “Roll-Up”. Now you can define the name of the Roll-Up and choose which of your websites and apps should be grouped together under this Roll-Up. Please note that Super User access is required in order to create a Roll-Up. 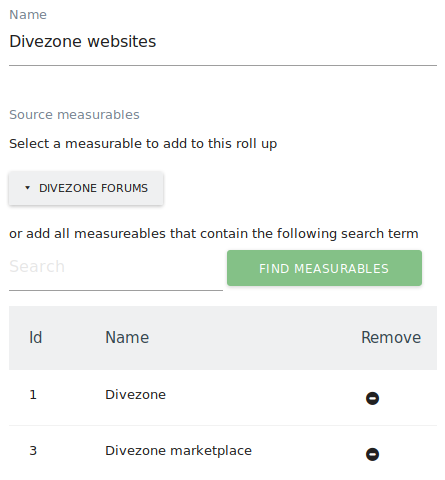 If you want to change a Roll-Up at a later point, simply go to “Measurables: Manage” again and click on the “edit-icon” for the Roll-Up you want to change. You can create as many Roll-Ups and assign as many websites and apps to it as you wish. You can view all reports for Roll-Ups just like you do for any other website or app. 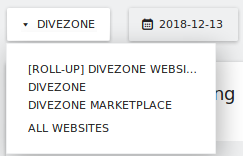 To make it easier for you, we prefix Roll-Ups in the “website selector” and “All Websites Dashboard” with “[Roll-Up]”. This allows you to quickly identify such sites and search for them. In the Visitor Log and Real-time widget you will see all visitors across several websites. To still know which website a visit belongs to, the name of the website is shown above the visit details.